The dissembling here is two-fold. First, they describe racial group differences as religious. Second, and far more important, they ignore jewish anti-White animus. So how does this White “liberalism” they describe work? They see that the broad-minded White “liberal” individualist don’t-take-your-own-side attitude is not just a poor long-term strategy for the individual, but leads directly to extinction for the group. So how is it that such passive, insecure nothings ever came to run the show? The answer is that Whites don’t run “liberalism”, the jews do. It is specifically because jews define what contemporary “liberalism” is that White “liberals”, as effete as they are, have gotten and will continue to get the blame for it. The shift in control over “the philosopy of society” (called “liberalism” ever since the American and French revolutions) from White/Aryan to jew is clearly visible in the shift in attitudes about free speech. Judge Jackson’s dissent in Terminiello v Chicago, in the wake of WWII, shows an increasingly judaized “liberalism” pushing back against White “liberalism”. Father Terminiello, sometimes called “the Father Coughlin of the South” because of his anti-Semitic rhetoric, was an Alabama priest who, at the time of this case, was under suspension by his church for distributing anti-Jewish literature. Well known for his controversial views on Jews, blacks, New Deal Democrats, and just about everybody else not white, Christian, and conservative, Terminiello came to Chicago from his home base of Birmingham. He was invited by a group called the Christian Veterans of America in 1946 in order to make a speech at the West End Women’s Club. Terminiello’s appearance was attended by a capacity crowd of about 800. Meanwhile, a hostile mob of protesters, estimated at well over 1,000 people, gathered outside the auditorium. The tone of Terminiello’s speech, which straightforwardly attacked “Communistic Zionistic Jews,” African Americans, and Franklin D. Roosevelt, among others, incited the crowd outside to violence. Police were unable to contain the disturbance. Scores of rocks, bricks, bottles, and stink bombs were thrown, resulting in 28 broken windows, 17 arrests. In the wake of the mayhem, an organization called the Chicago Civil Liberties Committee filed a complaint against Terminiello, claiming that he had violated a Chicago ordinance against disturbing the peace. The language of the ordinance declared it illegal to create a “diversion tending to a breach of the peace.” Terminiello was convicted and fined $100 for his role in the disturbance. Two higher Illinois courts upheld the conviction. Terminiello eventually brought his case to the U.S. Supreme Court. In a 5-4 decision, the Supreme Court reversed the ruling of the Illinois courts, and overturned Terminiello’s conviction. 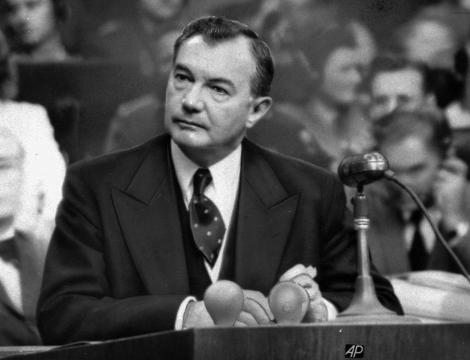 In a long, emotional dissenting opinion, Justice Jackson was clearly influenced by his own recent experience as chief U.S. counsel at the Nuremberg trials of Nazi war criminals. To Jackson, Terminiello’s language was too close to that of the fascists, whose defeat was considered important enough to justify going to war. There is danger that, if the Court does not temper its doctrinaire logic with a little practical wisdom, it will convert the constitutional Bill of Rights into a suicide pact. In effect, Jackson was saying that the Constitution, the most significant document of White “liberalism”, must be interpreted and even ignored in order to suit the best interests of the jews. Here’s Metapedia’s page on Robert H. Jackson, to which I added a bit about Terminiello v. City of Chicago, Constitution not a suicide pact. “Now, let me say, I am going to talk about–I almost said, about the Jews. Of course, I would not want to say that. However, I am going to talk about some Jews. I hope that–I am a Christian minister. We must take a Christian attitude. I don’t want you to go from this hall with hatred in your heart for any person, for no person. . . .
“So, my friends, since we spent much time tonight trying to quiet the howling mob, I am going to bring my thoughts to a conclusion, and the conclusion is this. We must all be like the Apostles before the coming of the Holy Ghost. We must not lock ourselves in an upper room for fear of the Jews. I speak of the Communistic Zionistic Jew, and those are not American Jews. We don’t want them here; we want them to go back where they came from. [Peter] Beinart displayed unflinching resolve to advance and to defend his liberal-democratic values – down to the last Israeli. It must be remembered that commitment to liberal democratic values is not a suicide pact. THE CURRENT JEWISH power play in the Middle East poses the gravest imaginable dangers to America. Yet, in the midst of these dangers is a development which offers the promise of great good to the American people. That good is the disruption of the American liberal establishment and the extensive undermining of the traditional alliance between Jews and Gentile liberals. It is interesting to note that liberals, who have always insisted that a person must be judged only as an individual and not as a member of a racial or ethnic group, accepted without hesitation the thesis that the Jews, as a people, were entitled to immunity from criticism and to collective reparations for the disabilities which some individuals among them, no longer present for the most part, had suffered earlier in Germany. Liberal writers who condemned in the harshest terms the German practice of shooting Jewish political commissars whenever they were discovered among captured Soviet troops, refer in an indifferent and offhand way to the brutal torture and murder of tens of thousands of German SS men, the elite of their nation, who, after they had laid down their arms and surrendered, were turned over to Jews in U.S. Army uniforms to be castrated, used for bayonet practice, and subjected to other tortures too gruesome to recount. Before the Germans it was the Russian Czars who persecuted this race of professional “victims,” and before them it was the Polish peasants, and the Spanish Inquisitors, and the English yeomen, and the French Crusaders, and the Roman legions, all the way back to the Egyptian Pharaohs. Westerners, and not just the liberals among them, have always been suckers for a cleverly managed act of martyrdom. The jewish problem traces back long before “liberalism”, the jews have been “suicide pacting” their hosts for millennia. In a land of almost 314 million “residents,” how important could one old, crotchety, heterosexual, white Christian man have been? Only the most vile sycophants of this self-professed jewish fifth columnist continue to celebrate him. Tellingly, they do it either by ignoring or distorting what he really was or what he really cared about. Lawrence Auster was a jew whose most fervent passion was sniffing out and denouncing “anti-semitism”. For years, he argued what I considered to be a mistaken position, that the Left believes in “egalitarianism,” “tolerance,” and “non-discrimination.” In fact, as I have pointed out for years, the Left actually believes in power—and is willing to accept the most extreme inequality, intolerance, and discrimination. Auster meticulously cultivated a constant but superficial discussion of symptoms, most of which he attributed to “liberalism”, a vague catch-all for anything Auster disliked but didn’t more specifically identify as “anti-semitism”. He disapproved of terms like “the Left” because he wished to obscure the jewish source of anti-White animus, not expose it. For this reason his view of race was similarly cartoonish. He usually maintained that jews are “white”, and “whites” are doing everything to ourselves. When push came to shove he not only saw the difference, he sided with the jews against Whites. It was because of this position, and in spite of any prickliness when challenged on “mistakes”, that Auster attracted worshippers like Stix – a motley assortment of jews, crypto-jews, quasi-jews, wanna-be jews and jew-firsters who see “white” judeo-Christian “conservativism” as their greatest strength. They could imagine clarity and truth in their guru’s dissembling and dissumulation because in that guru and his double-talk they saw themselves. Mr. Auster was born in Union, New Jersey in 1949 to Sean Irving Auster, an early electronics whizkid, businessman, and real estate investor, and Charlotte Auster, a homemaker. From the age of 11 he grew up in South Orange, New Jersey, where his older siblings introduced him to classical music and Bob Dylan, both lifelong passions, along with poetry. He attended Columbia University for a year and witnessed the student riots in 1968. He did not like the Ivy League university, which he found too impersonal. He also attended Bard College for a semester before deciding that he needed to educate himself on his own before completing a bachelor’s degree. In the 1970s, he lived a bohemian life in Aspen, Colorado, playing guitar, reading great works of literature, working at a book store, and, it amused him to recount later, wearing a sandwich board through the streets of Aspen with the menu of a local restaurant. For a while, he was a professional astrologer. He then earned a bachelor’s degree in English at the University of Colorado in Boulder. For a time, he was a follower of the Indian spiritual leader Meher Baba, traveling to India to visit his center there. He discovered his main subject when he was walking through Manhattan one day and, looking at the people around him, suddenly realized that whites were on their way to becoming a minority in America. He said that since he was so firmly convinced of the essential humanity of all people, he felt suited to writing about the controversial subject of race and challenging the crippling plague of white guilt. 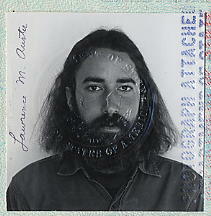 How absurd and yet how stereotypical that this ex-hippie, this wandering jew, had the arrogance to proclaim his jew-first moralizing and pilpul “traditionalism”, not to mention deliver it from the very epicenter of cosmopolitan jewry, that Other who has taken over the West, whose poisonous influence he mostly pretended not to see. Auster never challenged “the crippling plague of white guilt”. That would have required acknowledging the distinction between the Whites being guilt-tripped and the jews, like himself, who perpetrate it. If Auster’s traditionalism meant anything, it meant only a reform of White guilt, redirecting and refocusing its benefits back to the jews alone. What irked Auster was not that Whites defer to anybody, but that Whites defer to anybody but the jews. So before we recoil in horror or embarrassment from speaking explicitly about race, let us remember that America’s current politics is already a race-conscious politics, only it’s a politics based on lies about race. It’s a politics directed against whites and their civilization. And it pretends that it’s not about race at all, but that it’s race-neutral and universal. So instead of today’s race-conscious politics, which is based on lies about race, let us have a race-conscious politics based on truths about race. Long-term harmonious relations between a racial majority and racial minorities are possible only when the minorities do not exceed a certain percentage of the population. While individuals of different races living in the same society can get along on a basis of equality and mutual recognition, entire races, living in the same society, cannot. In the right circumstances, individuals or small groups of one people can be assimilated into a host culture of a different people, but there are limits to such assimilation. Certainly if the entire people associated with the host culture is displaced or swamped by a different people, the host culture will also disappear. Even smaller shifts in numbers can be enough to delegitimize the host culture and produce chronic cultural conflict. Therefore, the culture, identity and traditions of white America and Western civilization cannot survive in any community or institution that becomes multiracial or white-minority. Because of the greater attractiveness, prosperity and openness of white Western societies, nonwhites will keep moving into them as long as they can. Therefore white America can survive demographically and culturally only if it recognizes itself as a threatened ethnoculture; if it ceases or drastically reduces, on a national scale, all non-European immigration; and if it assures, on a local scale, communities where its own institutions may survive. The large and enduring differences in average intelligence between blacks and whites mean, first, that blacks on their own can never be expected to maintain a modern, democratic, civilized society; and second, that blacks can never be expected to achieve collective economic equality and other kinds of parity with whites. The forced attempt to achieve such collective equality, through affirmative action and through endless attacks on white racism as the supposed cause of existing inequalities, can only break down all the institutions and standards of society and lead to race warfare. There are therefore only two sane options for black-white relations in this country. Either blacks accept the above facts; accept a society where white Western standards of law, behavior and intellectual life are dominant and where advancement will be open for blacks only on an individual, not a collective basis; accept their status as an ethnic minority and be grateful to be living in a white society where they have goods and opportunities undreamed of in a black society; or else, if blacks are not willing to accept these things, then to avoid race warfare there must be peaceful separation between the races. These propositions have nothing to do with any notions of race-hatred of the other, or of race-worship of one’s own. White people are just as sinful and imperfect as any other people. Unlike ideologies such as Afrocentrism and Nazism, which are based on the deification of one’s own people and the demonization of others, this new politics is based on a Christian recognition of our human limitations, namely that we do not possess the godlike power to create a perfect world where everyone is equal, and where differences don’t matter. If there is any arrogance to be seen today, it is in our current immigration and affirmative action policies, which are among the greatest examples of hubris in the history of the world. There are only two sane options for black-white relations in this country. The irony is that whites are terrified that non-whites will hate them and even start a race war if whites stand up for themselves, while the truth is that many nonwhites will begin for the first time to respect whites. Currently minorities don’t respect whites because whites have defined themselves ideologically as nothing while, in personal terms, they still try to protect their self-interest. Whites thus seem both weak and hypocritical and therefore despicable, and nonwhites just keep moving into the vacuum left by white surrender. But when whites begin to assert their own civilizational and racial identity and their desire to preserve it, not in a hateful way but in a calm, intelligent and firm way, then nonwhites will begin to see whites, not as the “oppressors” of left-liberal demonology, but as human beings who have the same basic interests and concerns for their people and culture that the minorities have for theirs. Classic. Auster discussed blacks and Whites and other Others in terms he literally found unthinkable to apply to jews. He spoke of “minorities” and “oppressors” and “left-liberal demonology” as if it is all a figment of the imagination of Whites and had nothing whatsoever to do with the jews. The irony is that so many Whites are terrified that jews will hate them, even though jews already make their contempt plain enough. Auster went against that grain by advocating a “white” racial identity, but of course, it was only to the extent that he thought that would best serve the interests of jews, not Whites. Auster’s importance, if anyone wishes to recall it accurately, was in being even more condescending and less honest than usual for a jew. I shared my thoughts about Auster’s legacy in Auster’s Personal Announcement, when he first announced his illness in August 2011, and then again two weeks ago in Assessing Auster. Today one of Auster’s “vile sycophants”, Laura Wood, announced his death. But the blogging career that stands out on the Internet and in the history of American letters as a tour de force of philosophical and cultural insight is over. Mr. Auster entered a state of sedated and sometimes pained sleep the next day, after a night of agony. He spoke no more than a few words during the next two days and died peacefully this morning after about ten hours of unusually quiet and mostly undisturbed rest. Only extreme incapacitation could have brought that career to a close. For many of us, it was a marvel, a form of essential daily food. No man gave more to his readers. No writer responded more energetically to the people who took in his words and either approved or rejected them. No thinker, except perhaps Plato, jousted more ably with his students or left such an elegant and finished record of philosophical conflict and resolution. He was philosopher, journalist, guru and cultural psychoanalyst in one. And no writer on culture and politics had sounder judgment about the world around us, or more brilliant observations. The relationship between Mr. Auster and the hundreds of often-anonymous correspondents who wrote to him over the years was like that between a boxing coach and his fighters. He trained his followers in the art of intellectual combat — and the price was a staggering workload as he edited the debates that have appeared here over the years. He paid tireless tribute to the fight for truth. But, as he insisted, he wasn’t a hero. He was just doing what came naturally. He was doing what he had to do. Sadly, as of today, View from the Right, except for an entry about his funeral and possibly more on his death, will become inactive. He wanted it that way. VFR could not continue beyond Mr. Auster’s death because it is the creation of an utterly unique personality and mind. The site will, however, remain online permanently, as long as the Internet exists. There are also plans to collect his writings, both those found here and those unpublished, in book form. At the time of his final siege of illness, he was working hard to make that happen. His work will continue to be read and appreciated. The number of “vile sycophants” will grow. Falsehoods will for many years more be overturned by those who have come in contact, directly or indirectly, with Mr. Auster. I am certain of that. It means all the more for a friend and supporter like Wood to so clearly note Auster’s guru-like, psychoanalyst-like traits, as well as the sycophancy he attracted and cultivated. These are recurring patterns in jewish intellectual movements which Auster’s nemesis Kevin MacDonald has identified and discussed. The “movement” around Auster will dissolve without its Energizer Bunny guru. True to his jewish heritage, Auster was a totalitarian bolshevist control freak. This was evident in the meticulous editing and pasting required to fit each individual comment from private email into the public, micromanaged “debate” on his blog. It was also evident in the way he would regularly inform other bloggers which commenters or topics were anathema. The essence of Auster’s project, his “View from the Right”, was to inform others how to see the world, the “right” way to think about it. His two most frequent themes were “anti-semitism” and “liberalism” – with the underlying connection between these, and most of his other topics, being his and his sycophants’ overriding concern for the best interests of the jews. 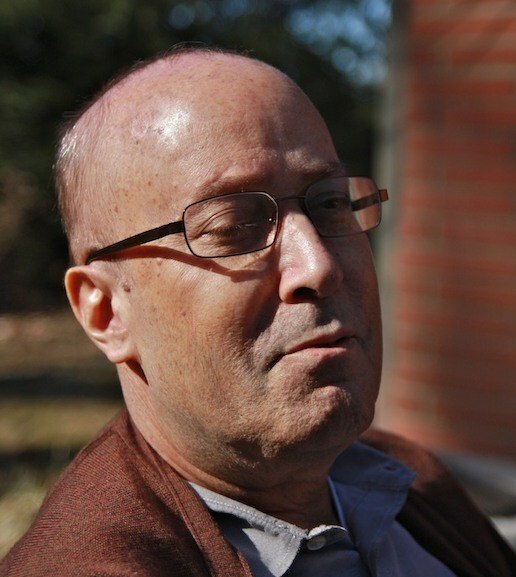 Auster attempted, in a way, to do to White racialism what Norman Podhoretz and his Trotskyite “liberal” jew inner circle did to American conservativism – replacing White priorities with jewish priorities. Auster wanted “whites” to think about race to the extent it entailed criticism of or even separation from muslims, blacks, or mestizos. But at the prospect of Whites regarding jews likewise Auster’s usual pretense at principle and reason and decorum suddenly reverted to the unhinged pathologization and demonization so perfectly typical of his tribe. Today the White race lost a self-professed jewish fifth columnist. Hallelujah! This is true, but too charitable. Auster often writes about “whites”, seemingly sympathetically. His overriding concern, however, is for the jews. Auster has called out jews, but only to deliver a proverbial slap on the wrist. He ultimately excuses jews of any real wrong-doing vis-a-vis Whites. He faults jews mainly for not doing what’s he thinks best for themselves. He accompanies most of these critiques with far more venomous words aimed at White “anti-semites”. Auster frequently distinguishes jews from Whites, and invariably puts jewish interests first. At the same time he condemns Whites who distinguish Whites from jews, even those who only unconsciously or inadvertently put other interests ahead of those of jews. Auster’s critiques of jews are innoculative. He offers strong-sounding but fundamentally weak arguments that could be made more forcefully, especially if made from the point of view of Whites. His efforts are preemptive and proscriptive, the effect if not intent being to discount and discredit a truly pro-White position. He has regularly incited “the majority” to “assert itself”. Meanwhile he attacks even the most mild-mannered White opposition in which he detects a whiff of “anti-semitism”. Auster’s analysis of others can often be mapped onto himself or jews in general. For example, Auster does not regard Whites as his people. In effect, he sees only “whites”, deliberately conflating jews and Whites, similarly to how he says Podhoretz sees “America”. Jewish rhetoric is often aimed at a broader collective, at least until they feel the specific needs of jews are better served by speaking more directly in terms of jews. As I noted in Auster’s Personal Announcement, he has never forgotten who his people are. The First Law of Jewish Influence demonstrates how shallow his big ideas are and how transparent his dissembling is. Jews like Dershowitz are completely unable to see the situation from the perspective of those he condemns. Unfortunately, Dershowitz is entirely within the mainstream of Jewish opinion and activism among American Jews and certainly within the organized Jewish community in America. The key difference is that jews like Auster are able to see the situation from the perspecitve of those they condemn. They may wander farther afield, but they remain part of the jewish whole and play their own part in its fight against “anti-semitism”. Whereas mainstream jews like Dershowitz openly identify themselves as jewish warriors, jews like Auster insinuate themselves among us, dissembling and dissimulating, posturing in ways that fool some Whites, at least for a while. I’ll be appearing with Kevin MacDonald on Carolyn Yeager’s Saturday Afternoon with Carolyn Yeager tomorrow at 2PM ET to discuss Auster. Join us then. 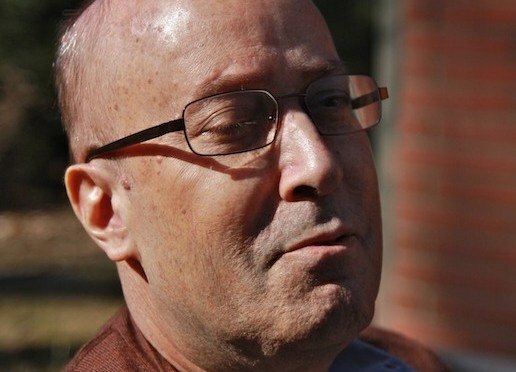 Last June, just under a year ago, I was diagnosed with metastasized pancreatic cancer. Thankfully, I have had enough energy to continue blogging, though not enough to write full length articles or engage in real debates. On occasion I’ve let an issue go because mustering the evidence and arguments to respond to an opposing position was beyond my capacity. This is not because my brain is not sharp, but simply because I have lacked the energy to do the intellectual work that is needed for certain kinds of writing. Another way the illness and treatment have affected me is that I avoid things that are very stressful or upsetting. For example, I didn’t write about the Ground Zero mosque issue for months last year because I found it too stressful, though I did start writing about it in August, partly because I was feeling better and could handle it. Similarly, I avoided writing about the movie Machete last year. I just didn’t want to deal with something that evil. Also, as a result of my condition and inability to handle stress, I have become more intolerant than before of correspondents and online commenters who, instead of dealing with the issue at hand, make negative comments about my personality or ad hominem statements of any kind. I have zero tolerance for that now and I simply stop communicating with people who do that. 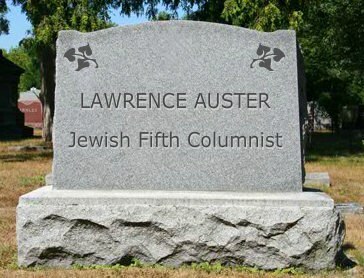 It’s a bit premature, but here’s my epitaph for him: Here lies Lawrence Auster, a full-blooded jewish convert to Christianity, a jewish fifth columnist who never forgot who “his people” were, who on a weekly if not daily basis tossed off sweeping, grandiose, negative, zero-tolerance comments about Whites, blacks, muslims, Christians, liberals, conservatives, Europeans, the French, the British, the Germans, the majority, and last but certainly not least, the “anti-semites”, all self-righteously counterposed with a talmudic, hair-splitting, eggshell-walking, anally-retentively-qualified, infinitely-tolerant circumspection concerning the jews and Israel.